Barring Kanye West, it’s not news that the vast majority of hip-hop artists — from underground rappers to icons like Jay Z, Snoop Dogg, Eminem and T.I. — have become powerful voices in the resistance against President Donald Trump. But only a few years ago — as recently as 2015 — hip-hop’s storied relationship with the celebrity business mogul-turned president told a very different tale. Trump was an indisputable icon in hip-hop music for decades, and the admiration for his success and swagger is documented in more than 300 rap verses. Lyrics examined by ABC News show Trump was hailed for his wealth and power and idolized in songs that date back to at least the late 1980s. “He was an American icon that stood for success and wealth, and that was something that was valued, particularly among a community of folks that were coming from lower class backgrounds and people who were locked out of the mainstream American economy,” Bakari Kitwana, the Executive Director of Rap Sessions, told ABC News. Donald Trump leaves Trump Tower. Before he ran for president, Trump got shouts-outs from virtually every corner of the hip-hop world — West Coast rappers like Snoop Dogg and Kendrick Lamar, East Coast rappers like Puff Daddy aka P. Diddy and 50 Cent and southern rappers like Lil Wayne and Jeezy. Several songs were even named after Trump. And in more than 60 tweets about hip-hop, Trump either wrote about songs he was mentioned in or artists who praised or criticized him. “Oh no, another rapper doing a Trump song –“Young Jeezy – Trump Lyrics.” Why aren’t these guys paying me?” Trump tweeted in 2012. Oh no, another rapper doing a Trump song –“Young Jeezy – Trump Lyrics.” Why aren’t these guys paying me? In nearly 50 tweets, Trump wrote about Miller’s 2011 hit, “Donald Trump,” going from slamming the rapper and demanding that he gets royalties from the song to boasting about how many views the song got and claiming that it’s doing well because Miller used his name. @macmiller “Donald Trump the Song” gets 16M hits on YouTube. Who wouldn’t be flattered? From modern day stars like Jay-Z, Kendrick Lamar, Rick Ross and Nicki Minaj, to old-school legends such as Ice Cube, Raekwon, Master P., Busta Rhymes and Mos Def, Trump and his brand were name-dropped by top artists in hip-hop for nearly 30 years and several mentioned him more than once. 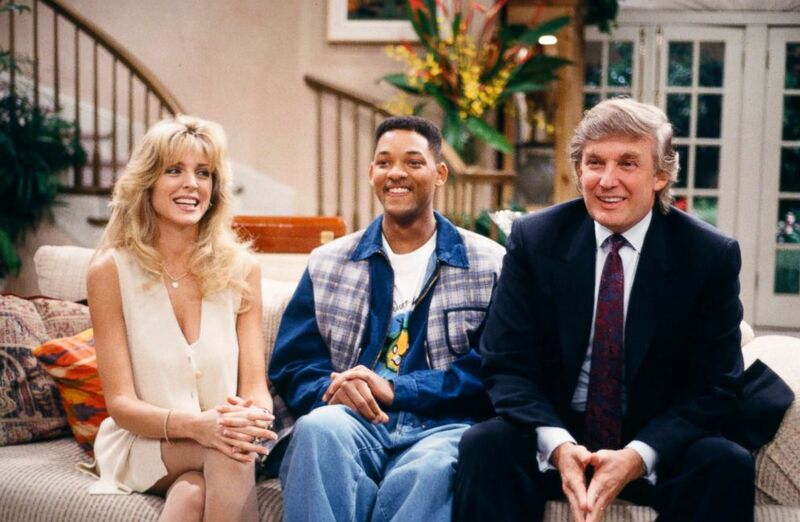 At the time, Trump was seen attending parties with Puff Daddy, was personal friends with hip-hop mogul Russell Simmons and was making guest appearances on iconic shows like “The Fresh Prince of Bel Air” alongside Will Smith. Trump even appeared on G-Unit radio in 2005 with 50 Cent. Trump noted Diddy’s admiration for him by sharing an article about it in October 2015. But Kitwana, a culture critic who wrote the book, “Why White Kids Love Hip-Hop,” cautions that Trump’s relationship with hip-hop was always about Trump. References to him were “more of a nod to the aspirational culture in hip-hop,” Kitwana said, not an indication that the business mogul, who spread birther theories about Barack Obama, launched a crusade against the Central Park Five and mocked the “Black Lives Matter” movement, was a friend to the hip-hip community. 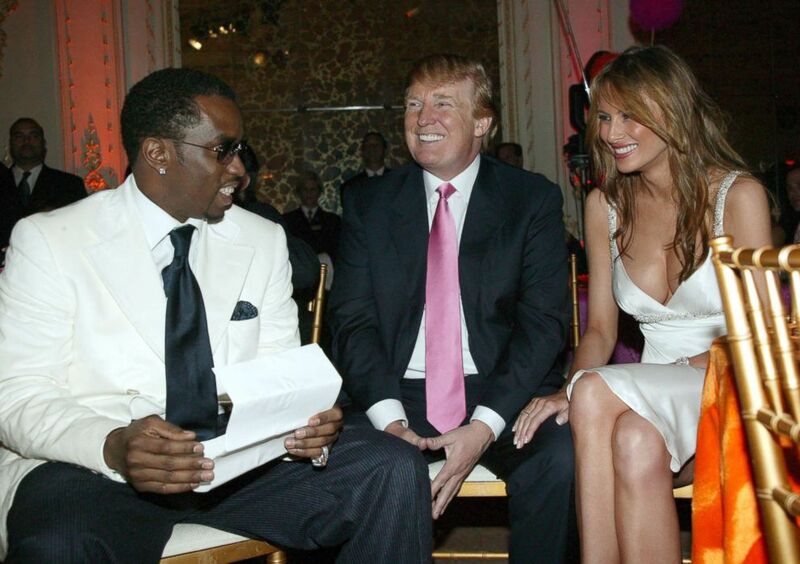 Sean P. Diddy Combs, Donald Trump and Melania Trump in Palm Beach, Fla.
Having a big ego has also been central to many rappers’ identities and the subject of many rap songs — and many rappers referenced Trump to boast about themselves. Few politicians talk about “winning” as much as Trump. The president continued to boast about winning the election months after Inauguration Day, vowed that America will “get tired of winning” if he’s elected and has boasted about winning everything from the presidential debates, the economy, and the polls. Trump even treated his first divorce “as a business deal and he cannot lose, he has to win,” his ex-wife Ivana Trump told ABC News in October 2017. Hip-hop lyrics are filled with success stories from many artists who come from humble backgrounds and the name “Trump” — which also happens to rhyme with a lot, Kitwana noted — was the perfect reference for many rappers to bring the point home. 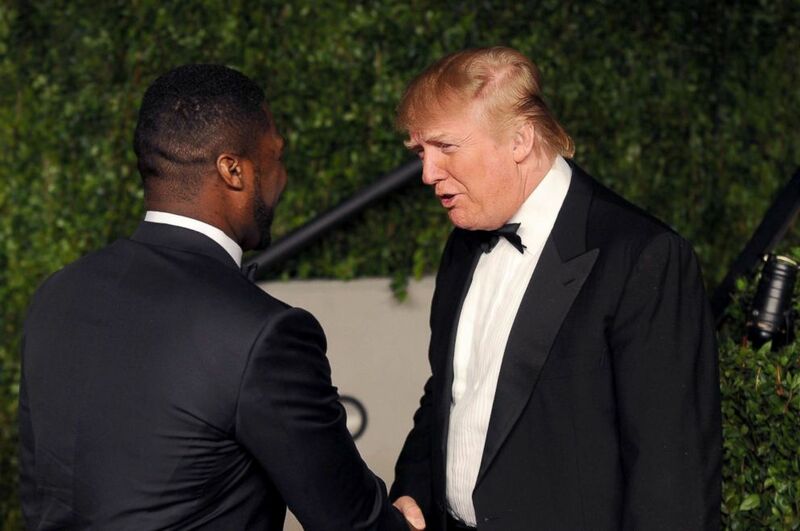 50 Cent and Donald Trump arrive at the Vanity Fair Oscar party hosted by Graydon Carter held at Sunset Tower, Feb. 27, 2011, in West Hollywood, Calif. In “How to Get Rich,” Trump reflects on the powerful brand name he has built and boasts about how the name “Trump” has come to symbolize quality and success. 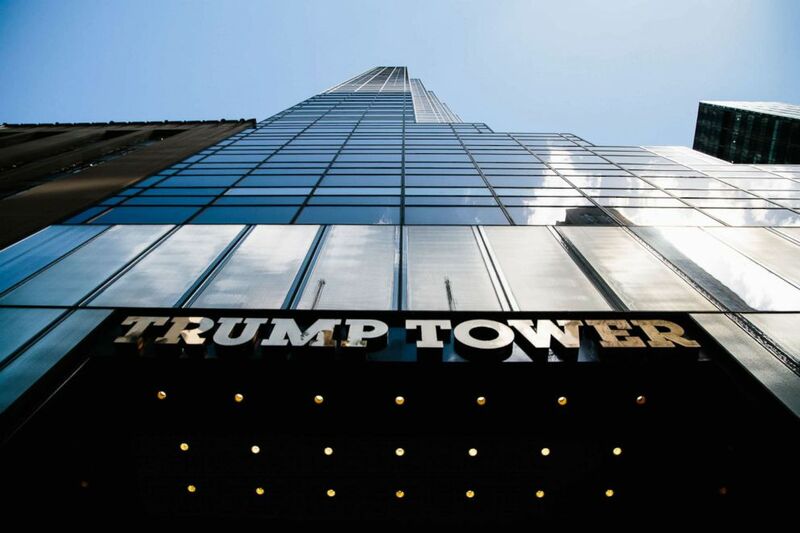 A view of Trump Tower in New York, June 14, 2018. A revealing excerpt comes in the beginning, where Trump relates the story of how he decided to name Trump Tower after himself. He was definitely right, and hip-hop took notice. For years artists promoted Trump’s brand. Since the ’80s, Trump Tower in New York City and Trump’s casinos in Atlantic City were powerful symbols of the Trump empire and were frequented by many rappers. “I copped enough coke and guns to open Trump Towers of my own, then I control the slums,” he raps in the song. Upon jumping into the presidential ring, Trump quickly became hip-hop’s public enemy, number one. Artists may have liked his persona, but they did not like his politics. Although Kanye West, who is set to meet with Trump at the White House on Thursday, has remained defiant in the face of backlash over his support for the president, the rapper’s stance, which has prompted a firestorm from fans and artists alike, is virtually an outlier in the hip-hop community. Donald Trump, Melania Knauss and Russell Simmons at Beverly Hills Hotel in Beverly Hills, Calif. Citing everything from his dismissal of the “Black Lives Matter” movement, his advocacy for stop-and-frisk policing policies, his comments following the deadly 2017 white supremacist rally in Charlottesville, Virginia, to his ongoing battle against NFL players who take a knee during the national anthem to protest racism, plus a host of other controversial comments on race and racism in America, hip-hop artists have railed against Trump in both lyrics and public appearances. Rapper Snoop Dogg roasts Donald Trump onstage at the Comedy Central Roast Of Donald Trump at the Hammerstein Ballroom, March 9, 2011, in New York City. Rappers like Jay Z, T.I. and Snoop Dogg — all of whom celebrated Trump’s wealth in the past — became some of his most vocal critics. “Can you imagine what the outcry would be if @SnoopDogg, failing career and all, had aimed and fired the gun at President Obama? Jail time!” Trump tweeted in response to Snoop Dogg’s 2017 video for “Lavender,” where he aims a toy gun at a clown appearing to be dressed up as Trump. Termanology, who has been performing “How We Rock” at his shows since 2008, reflected on the evolution of the symbolism of “Trump” and said that his own verse now carries a different meaning.